The mobile web excels at reaching new users, but not at converting them into frequent visitors. 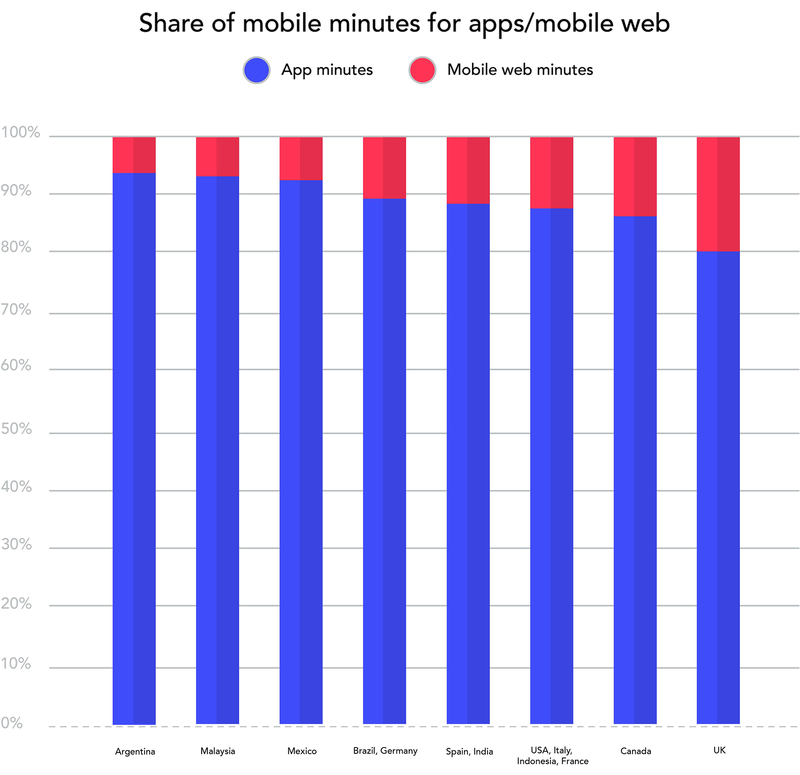 The statistics in ComScore’s Global Mobile Report (2017) back this up, showing that the time an average user spends in native apps varies from 80 percent (UK) to 94 percent (Argentina). Surprisingly, 80 percent of app time is spent using the top three apps (95 percent using the top 10). 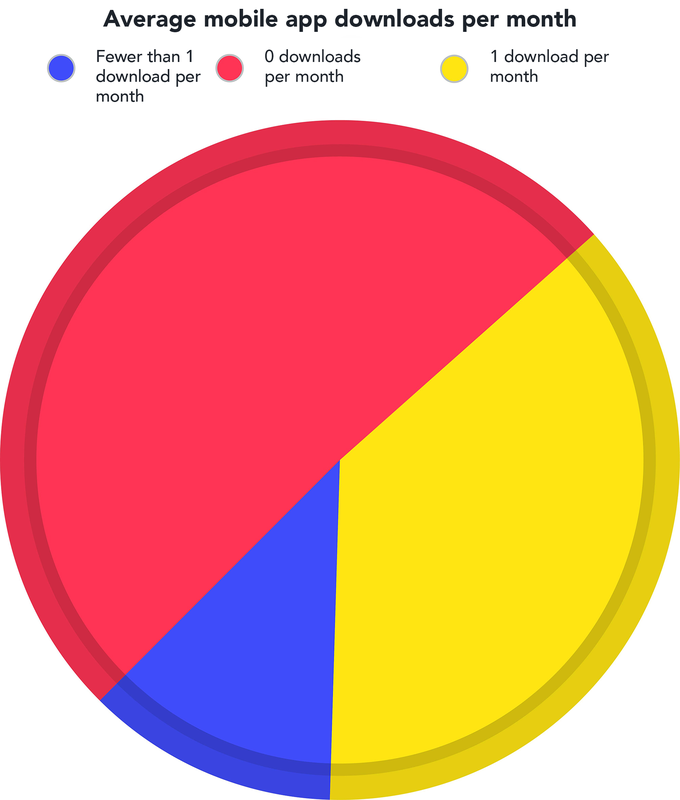 Indeed, each month, half of mobile users download no new apps, some only one, and a mere fraction more than one! On the other hand, on average, a mobile user visits 100 sites during that same period. Why is this the case? Good native apps start quickly and smoothly, work offline, use push notifications for user re-engagement, and make use of smartphone sensors. Bad ones simply don’t sell. Meanwhile, the mobile web could be described as slow, dependent on network status, and limited to browser features only—no push notifications or access to the capabilities of smartphone sensors. Native apps can easily be found on the home screen; yet, with mobile web apps, you have to remember at least part of a URL or find it among your many bookmarks. The question is: does the mobile web have to be this way? Fortunately, the answer is no—thanks to Progressive Web Apps (PWAs). In this blog entry, I will provide a brief introduction. The concept of PWAs, introduced by Google a few years ago, proves that the mobile web can overcome these issues. But, what are these mysterious PWAs and how can one magically apply the technology to their website to keep users from bouncing off? Many describe PWA as a set of technologies that delivers a certain experience to users, but in its simplest form, PWAs are websites that behave like native apps. In fact, PWAs can load very quickly and reliably, work offline, are available from the home screen, are engaging (with features such as push notifications), and feel like apps. They can also be up-to-date, not affected by the user’s browser choice or screen size (they work and look equally good and stay in full-screen), and secure (since they work only through https). At the same time, they don’t lose the features of websites and can be discovered through search engines and shared through URLs. Offline, fast and smooth load experiences are delivered through service workers, which are responsible for caching assets and content.  They are also responsible for delivering the push notification functionality. A concept of an application shell with the combination of service workers delivers that ‘feels like an app’ experience. A manifest file enables you to put a PWAs icon on your home screen. What value do PWAs bring to me as a developer? What if I am a businessperson? Despite the growth in popularity of mobile devices, mobile developers are still not so easy to come by. Even if you do find mobile developers for your team, they might be able to support only a single platform. You will need another one to support another platform. And another one: Even if you are lucky enough and land a mythical hybrid mobile developer, the deployment to different platforms won't be as smooth (read: a couple of days for an app review in AppStore for each app version). Finally, what benefits can you expect to get from PWAs? A single code base means easier, faster, and cheaper delivery to market and support processes. Safety: all data sent will be encrypted thanks to https. Push notifications will keep your customers engaged and returning to your website. Lower user acquisition costs: Studies show that PWAs are 10 times cheaper than mobile apps. Lower data traffic costs: If designed correctly, only the essential data will be sent between the server and client, thus reducing yours and your users’ mobile data expenses. Note that in order to benefit from the advantages of PWAs, one doesn’t have to rebuild an entire website from scratch. You can also go with a simple version (and scale with time) or focus on a single feature. Will PWAs replace normal mobile apps? To paraphrase, will mobile developers become extinct as a species, with web developers taking over the world? I don't think so, but there will be a shift (which is already happening) from native or hybrid mobile apps to PWAs. Most business cases can be built with PWAs instead of native technologies. Of course, not all native mobile features can be accessed with web technologies, and you might be targeting a platform/browser that doesn't support PWAs. In these cases, you would still need to create native or hybrid mobile apps. PWA as a technology has not yet matured and shown all of its full potential. Already, major browser vendors are releasing updates every few months with new supported PWA features and hybrid mobile frameworks are offering ways to convert mobile apps to PWAs. The PWA concept is rapidly changing not only the way we understand mobile apps, but the web itself too.